What are the top landmarks in Marrakech? Watch spellbinding dance routines, interact with snake charmers and browse the market stalls in this fascinating cultural hub on a central square. Explore the great outdoors with a trip to Menara Gardens, a popular green space in Marrakech. Amble within picturesque gardens or visit the shops in this relaxing area. Explore the great outdoors with a trip to Majorelle Gardens, a popular green space in Marrakech. Amble around this relaxing area's picturesque gardens or seek out the local tours. You can search for that perfect souvenir with a trip to Menara Mall, a favourite shopping spot in Marrakech. Wander the picturesque gardens in this relaxing area. Step back in time and learn more about local history with a stop at Bahia Palace in Marrakech. Amble around the area's picturesque gardens or seek out the local tours. You can study the exhibits at Marrakesh Museum, a museum with a story of its own, during your travels to Marrakech. Amble around the area's picturesque gardens or seek out the local tours. Medina is a welcoming, romantic neighbourhood. Part of the neighbourhood’s charm is its rich culture. Many visitors come to enjoy the natural beauty of the gardens, while others visit for the local shopping. The Hivernage neighbourhood welcomes visitors, with its convenient options for restaurants. Broaden your horizons with some local shopping. The Gueliz neighbourhood welcomes visitors, with its convenient options for restaurants. Broaden your horizons with some local shopping. Palmeraie is a neighbourhood that welcomes all visitors. The Agdal neighbourhood welcomes visitors, with its convenient options for restaurants. Broaden your horizons with some local shopping. Avenue Mohamed VI is a neighbourhood that welcomes all visitors. In addition to its friendly people, the neighbourhood has many charming qualities. The rooftop was and peaceful courtyard were great sanctuaries from the noisy city life. 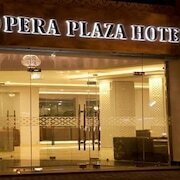 Ideally situated in a quiet alleyway, about 10 min walk to Jemaa el-Fnaa and 10 min to Bahia Palace. We did 2 tours outside the city and the pick up point was a 5 min walk to a roundabout just south of the Riad. The Riad is very well decorated. We made use of the Jacuzzi on the rooftop, there is a bar up there as well. Nice rooftop lounging access. Pool is there but a bit cool to use for this time of yr. Service was great. Breakfast included is jams, bread, eggs on request, pancake, yogurt, and cake. Coffee/Mint Tea. I would make use of the shuttle service to Riad (20 Euros), the taxi pick you up from Airport and stops at a Roundabout near the Riad, then a porter picks up your luggage and walks w/ you about 5 min to the Riad. Getting back to airport, best to get a taxi on your own, we bargained and got it for 100. MAD. 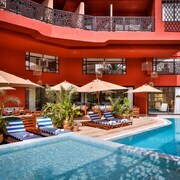 With an eclectic mix of Spanish, French and Arabian influences, the majority of hotels in Marrakech are seriously unique. 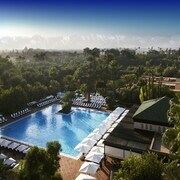 Marrakech hotels are so adept at welcoming guests that visitors will feel like a member of Arabian royalty. With exceptional 4-star hotels jostling for space among some relatively reasonably priced 5-star hotels, Morocco’s Red City is a fantastic destination whatever your budget. With direct flights into Menara Airport from many European capitals, visiting Marrakech has never been easier. Do yourself a favour and take a post-flight break in one of the many high-quality airport hotels, which offer fantastic discounts all year round. For those seeking an authentic Moroccan experience, head to Medina. This is the perfect spot from which to discover the hidden treasures of Marrakech. 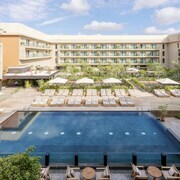 Base yourself in one of the area's superb luxury hotels before heading out to explore the city’s sights and sounds. Medina is simply overflowing with pretty riads and beautifully decorated dars. The traditional grand houses and palaces have been converted into some of the finest boutique hotels in Marrakech and are a great way to get a real feel for Moroccan life. Gain an insight into the history of the city with a visit to The Marrakech Museum, which houses a terrific collection of books, coins, art and pottery from Moroccan and Berber cultures. Soak up the unique atmosphere in Djemaa el Fna, one of the largest and busiest squares in Africa. Pick your way through the singers and storytellers to sample an array of authentic Moroccan delights from the overflowing food stalls. 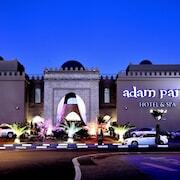 Exotic belly dancers, inquisitive Barbary apes and slippery snake charmers are just some of the sights that greet you in this extraordinary melting pot. Souvenir shopping is a treat as you are bombarded with an exquisite array of artisan jewellery, pottery, leather goods and a host of other traditional wares. Haggling is expected so don’t be shy! The square really comes alive at night, so why not quietly observe the madness with a glass of wine from one of the adjacent rooftop terraces? If your head is starting to swim, retire to one of the up-market luxury hotels just off the main square to plan your evening meal. Pepe Nero is a hidden gem tucked away behind the chaos of Djemaa El Fna. Enjoy a complimentary glass of prosecco in the romantic courtyard before tucking into the local delicacy of Moroccan pigeon pie. Looking to impress a loved one? Book into one of the city’s finest romantic hotels before taking an evening calèche (horse-drawn carriage) around the perimeter of Medina’s ancient walls. Of the 19 surviving gates in Medina, Bab Agnaou is particularly impressive. This 12th-century edifice is notable for being the gateway to the Royal Kasbah which houses the remains of the El Badi Palace as well as the intriguing Saadian tombs. Still in need of more inspiration? 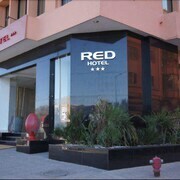 Check out our Casablanca hotels. Explore Marrakech with Expedia's Travel Guides to find the best flights, cars, holiday packages and more!